SALIMA-(MaraviPost)-Former Malawi First Lady Calista Wa Mutharika has ordered Malawians to stop calling him Calista Mutharika but Wa Mutharika. She said this in Salima district on Sunday during the political rally organized by UTM party. The rally was graced by the party’s interim President Dr Saulos Chilima who is also the country’s Veep. President Mutharika is in record telling Malawians during a political rally in Mzuzu city that Calista who was the wife to his late brother Bingu Wa Mutharika [Former Malawi President] is no longer part of their family and must stop using their family name. She said instead Malawians should call her Calista Chapola [her father’s name]. However, speaking at the podium while insisting to be part of Wa Mutharika family, Calista said the name Mutharika is cursed by God because of the cries of Malawians. According to her, Malawians have been and are still facing troubles under the leadership of President Peter Mutharika hence it is painful to her to be called such name as a mother and concern citizens. “I am eligible to be called Calista Wa Mutharika, no one can deny that. However, don’t call me Calista Mutharika but Wa Mutharika. This is because I don’t want to be called with a cursed name. I am also at pain with the suffering of Malawians under the current leadership. Calling Mutharika is an insult to me,” she lamented. She then urged Malawians to support UTM and vote for Dr Saulos Chilima as the country’s President in the coming polls. Who needs an inlaw like her? so we should vote for Saulosi because of the difference between you and your inlaw? You could do better madame. Apparently, it’s Callista who is cursed. 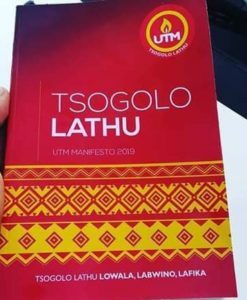 It seems all UTM leaders are drunkards. And Mchacha is probably right.